I'm declaring 2012 the year of beautification and what better way to kick it off than getting beauty tips from newly crowned Miss America, Laura Kaeppeler a beauty with an uplifting spirit to match. I was able to chat with Miss America about all things beauty at last week's Artistry 5:01 Party held at Bar Basque in Midtown Manhattan. The raven hair stunner was all smiles as she told me she likes to keep her beauty routine low key but with glam results and she found Artistry's products the key to delivering that. Along with Miss America, the other star of the night was Artistry Brand Ambassador Bridget, who has done an amazing job on my face at past events. On this evening, Bridgett added some smokey sparkle to my eyes and a dewy lip using products from the Escape to Paradise collection launching in March. Inspired by the colors of the Italian Riviera, the collection offers a universal sultry and sophisticated look. Head over to their site to find out more about Artistry's Spring Trend Colour Collection. Moving on to another great American beauty and my ultimate style crush, Tracee Ellis Ross is a fan of Kiss My Face Honey and Calendula Moisturizer. With natural beautifying ingredients like grape seed and olive oil which both aid in the repair of skin and calendula an age old healing ingredient, the natural products are key to maintaining natural beauty. Tracee who recently celebrated her fortieth birthday looks stellar in her new BET show Reed Between The Lines. The New Year air has been harsh so I've had to retain the moisture being withdrawn by these arid January temperatures. 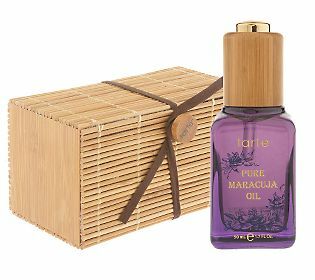 Tarte Pure Maracuja Oil is part of my daily routine from now until we get more moisture in the air. Found in the natural beauty product capital of the world; the Amazon, maracuja oil is derived from a passion flower which is high in essential fatty acids and Vitamin C. Found on QVC, this product has added dewiness to my skin and helped me reclaim the glow I seek year round. Along with my face taking a brutal beating from the weather, my hands and to be more specific, my nails are really taking a beating. I've started to use CND Solar Oil which is a nail and cuticle conditioner. Between harsh winds and constant hand washing, my cuticles can dry out in an instant. By applying the Solar Oil, I'm giving my cuticles a direct dose of moisture and putting an end to my nasty habit of picking at my cuticles. We still have eleven more months to go with the Year of Beautification get on board with these products and remember beauty is a beautiful habit.